The fact that a player is left handed should not be a problem. It may be a problem if the backhand of a righthanded player is weak. Sometimes the match is over before realising the opponent is left-handed. Remembering the fact that the opponent is not right handed can be the biggest problem, or not even realising the fact until the match is over! is the forehand or backhand (right hand or left hand side of the court) the strongest shot - as well as, is the strength in the front, back or mid court area of the court. is the forehand or backhand volley well placed - does it land close to the corners and wall. which corner of the court is the opponent's weakness. which return of serve (right side or left side) is the weakest shot. If it is not possible to find out this info before going on the court, the hit-up is the best place to observe these things. Personally, and from experience, I found it better NOT to think about my opponent as being left handed (as that can be a distraction) but use the monitor and evaluation methods and make the opponent run to all 4 corners during a rally and then hit the attacking shot to the weakest spot. Yes, to do this it is necessary to concentrate on each point, and if you forget the weaknesses, it costs points along the way. Spatial awareness is probably tested more with a lefthander and vice versa. That is another skill, knowing where the opponent is on court, and "reading" the play. Obviously, if you have a weak backhand there will probably be more attack on the backhand side, but that is ok as it is easier to use the opponent's power and controlling the racket head for a placement shot ( play more controlled shots), which can be quite a good thing. Q) How to deal with lefties? A) Reverse your normal strategy (which is probably fairly automatic and takes some concentration to change), ie serve from the lefthand box, play cross court lobs to land in the lefties backhand corner, play more consistently down the opposite wall, boast from the opposite wall, say, boast from the lefthand side to land in the righthand corner, landing on the lefties front backhand corner. I would try to mix up these strategies, 'cos as soon as the opponent gets the idea you are punishing their backhand they will start to predict your shots. Find a lefthanded player to hit with during training. Q) My problem with lefty is receiving the service when they serve from the left box to my right box. the angle at which it enters my vision and the path is different. How should I change my stance or positioning to better prepare to return this serve? Same with crosscort in the same positions. A) Sounds like it is more to do with your stance/position and movement to return the serve. Stand closer to the half-court line, stand forward in the service box, watch the opponent throw up the ball to serve taking notice of the speed of the hit, the angle of the racket, the height of the ball toss to get early clues to the height and angle of the serve. Move side-on to return the ball/serve to give greater options, eg straight drive, straight drop, volley boast. Q) power with the lefy forehand. Pace is quicker on most backhands- not just after ball is hit but how quickly the ball is hit (early). How to deal with this? A) Power (especially at this level of play) is generated when striking balls well away from the walls. Therefore, tighten up the drives and lobs preventing the opponent taking a big swing. Be sure the drives land behind the service box and head for the corners to force the play and a weaker return. I like the idea of bring the opponent forward with a boast, then take them deep, and this will open up the court and cause more defensive play from opponent. Q) Last is the right side wall, I'm not as tight on the forehand site because righties rally down the backhand. Can the lefties tell me what gives you trouble on the right side drives? pace? or high and tigher is more annoying (i.e have to backhand volley). A) Firstly, practice more pair routines, eg Rally down the forehand wall continually; Rally down the forehand wall one person attack, one defend. Pace without length and tight is not that effective when rallying for position on court. Pace is effective if it is meant to just get the ball away before the opponent recovers into position. When rallying for position on court, slow down the pace and try to get the ball tighter, then use the pace on the loose shot. High and tight on a person's backhand is always a good shot (takes skill to do a good high backhand return (one that actually lands in a corner or close to the wall). Find a lefthander to train with. Practice pair routines concentrating on deep and tight length, as above mentioned. Practice returning serves on your forehand to land in the front corner, the back corner. Tight is more effective than pace in the first instance. As accuracy improves then increase the pace. How to deal with lefties- more specific. Hi, Righty here. My problem with lefty is receiving the service when they serve from the left box to my right box. the angle at which it enters my vision and the path is different. How should I change my stance or positioning to better prepare to return this serve? Same with crosscort in the same positions. next has to be power with the lefy forehand. Pace is quicker on most backhands- not just after ball is hit but how quickly the ball is hit (early). How to deal with this? Last is the right side wall, I'm not as tight on the forehand site because righties rally down the backhand. Can the lefties tell me what gives you trouble on the right side drives? pace? or high and tigher is more annoying (i.e have to backhand volley). righties can also respond if you have any experiences! I supposed I had a bit of an advantage in this area when I was growing up. 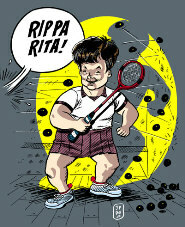 I'm a "righty" but my dad was a "lefty" (he's not dead - but has hung up his racket!). I used to remember watching him play when I was very young (about 4 or 5) and I eventually started playing myself just before 6. We used to go on court and play around and I used to take the opportunity to play as much on my backhand as I could. As the years passed my backhand was definately the better side of my game. More controlled, more accurate and more powerful than my forehand. I even found myself playing cricket with a left-hand stance because it felt easier than the right-hand stance (I used my hands the wrong way round on the cricket bat but it worked for me - it just looked strange!). Playing left handers certainly causes problems for a lot of players out there. In a club close to mine, they have 4 out of 5 of their top players who are all lefties! I think a good left handed player who plays to their strengths as your average club level, has an advantage of many of their equivalent right handed counterparts. Defending and attacking at the average club level, hasn't developed with a balance between sides. Very often players have strong forehands and weaker backhands. They learn that to win against most right handed players they need to play on the backhand side. I guess this is more of a practised-fiction than a fact! Whenever you play any player you should play to your strengths and their weaknesses - with the more important being their weaknesses! Forget "lefty" or "righty" and start learning to even up your game and strengthen your own weaknesses. That way you'll be able to play them on both sides of the court and handedness won't even come into it! Hi pug - aahh! Missed nicks lose rallies too. A fat gimpy level 1 from NSW here! It has been my experience that, once the serve is carefully delivered to the backhand side (showing their awareness of an opponent being a lefty) right handed players tend to fall straight back into rallying down the left side. we lefties like to encourage this too as we have a LOT more practice at forehand rallying than we have at backhand. So both end up playing to their respective strengths. Lefty strengths... well disguised forehand boasts, particularly when a straight drive from the rear of the service box is expected. I think we use variations in pace and angle better (I suspect this has to do with which hemisphere of the brain is doing the work). Most of the lefties I play with lately seem to be a touch more daring strokemakers too - righties seem to be 'hit it hard n chase it' stylee players. I have more trouble reading lefties' play, I think that pans with being more adventurous. Physically I dont think there is any difference (speed, endurance etc). Have a great day n remember dead nicks win rallies! !